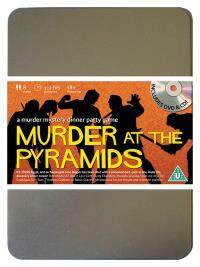 You've been invited to play the role of T’HOOTERS CALM’EM in Murder at the Pyramids. Egypt, 1924, and archaeologist June Digger has made the most incredible discovery of the century. Friends and luminaries have gathered to witness her findings but before anyone can say “Tutankhamun”, June is found dead, killed with a poison dart shot from a blowpipe. This was no curse, this was murder! Host your own party to find out who snuffed June’s candle! Egyptian Princess (she’s Egypt’s biggest assets!) Costume Suggestions : Your luxurious gold-threaded Egyptian gown complements the headdress, necklaces, beads and bangles you are covered with. Your flowing black hair is braided in places and covers your voluptuous bosom, but the thigh-length split in your skirt is longer than the Nile! I am a direct descendant of Queen Priti-Titi and rightful heir to the Egyptian throne. Unfortunately, Egypt doesn’t have a throne anymore, so I am resigned to staying in a luxury hotel suite at the taxpayer’s expense! However, I hope it will not be long before I can reign as Queen of Egypt and restore this beautiful land to its former glory.